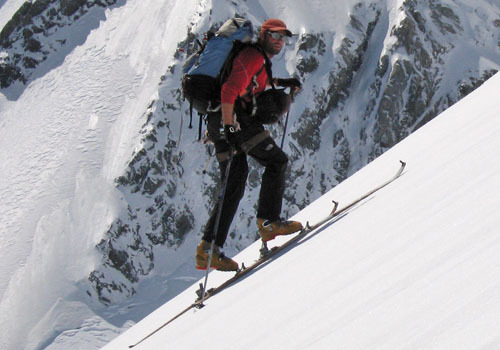 The optimal skin track angle is a subject of much debate in the backcountry skiing world. There are generally two schools of thought on skin tracks. Since you used "effective" rather than possible, my 2 cents would be that you should set the steepest skin track that allows you to climb at a consistent rate. If the track is so steep that you are stopping to rest every 10 steps, you will gain elevation slowly. There is also a school of thought that says your uptrack should be as beautiful as your tracks descending. This school tends to smooth transitions and lower climb angles. They view zig-zag kick turns as the method of last resort. The exact angle that will be 'too steep' on any given day is far too dependent on conditions and equipment to pick any numeric values. Generally it's somewhere between 20 and 30 degrees. A good rule of thumb is that if it's too steep to skin straight up, you should start thinking about avalanche hazard. As to when booting up is a more efficient means, this depends a lot snow conditions and how heavy your skis are. If the snow is hard and icy, crampons can be faster on even relatively flat slopes. I often use just crampons for early morning starts in spring corn snow ski season. Booting up is generally only used in soft snow conditions when the terrain doesn't allow a zig-zag skin track. (i.e. couloirs and narrow ridges.) And if the snow is deep enough booting up can be next to impossible. I think I've gone straight up 30° on good snow, maybe steeper for short bits. This would be on old Diamir bindings and fairly stiff alpine boots. As Dakatine mentioned, not all snow is equal, powder tends to let the tails drop even further than the actual slope. So loose snow, presence of hard ice are a problem, and of course you'll also want full length skins cut for maximum grip (minimum glide). But for an upper limit on what your gear can do, I think it's a matter of comfort & balance: your heel elevators, ankles & boot flex will determine the steepest angle where you can stand up straight. Not the answer you're looking for? Browse other questions tagged skiing backcountry alpine-touring or ask your own question. Is this image of a skier skinning up a very steep slope rotated? 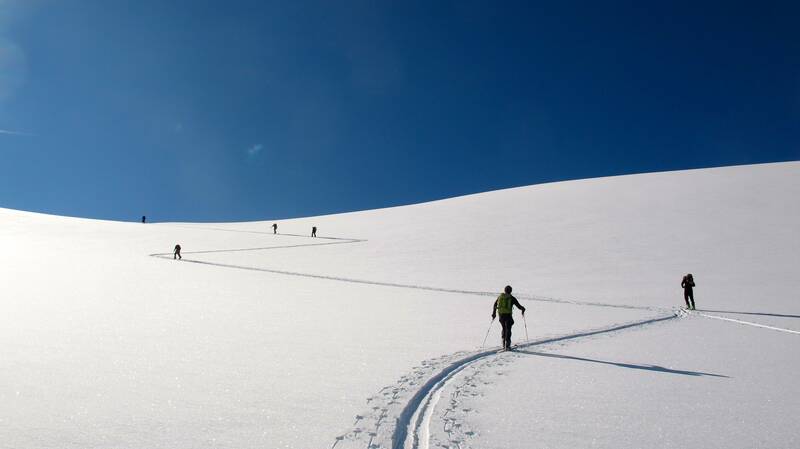 What's faster on packed, gradual terrain; skinning or booting up with skis on back? What is a good length for first back country skis?